Pockets of fresh fluffy buttery bread filled with delicious stringy cheese, fresh whole vegetables & Campania Tomato Sauce (what more could you want?). The real star here is the amazing partnership between Famoso Neapolitan Pizzeria & Mealshare. For the fifth year, Famoso & Mealshare have partnered to fight hunger. All proceeds of Campania Tomato Sauce sold until Dec 31st will go to Mealshare to help feed in-need youth in Canada. This hand-milled sauce can be found at all 30 Famoso restaurants located in British Columbia, Alberta, Saskatchewan and Ontario. 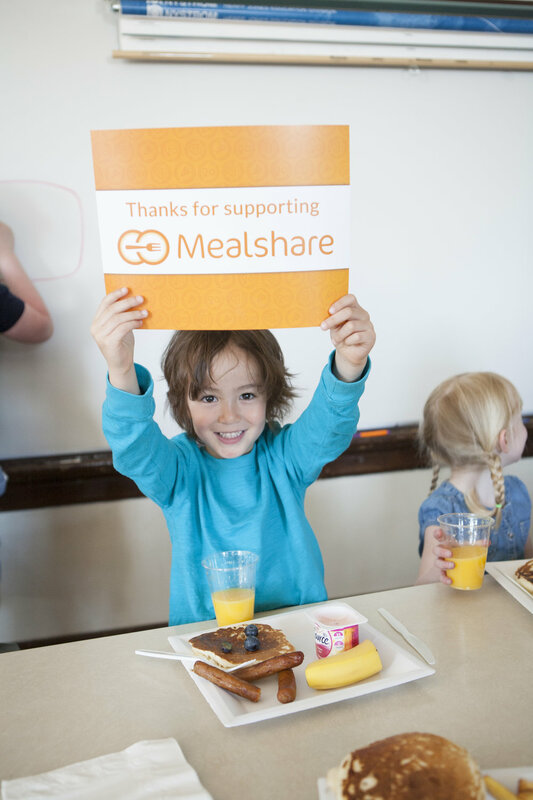 Mealshare's mission is to enable and inspire people to join the fight to end youth hunger. Funds raised from last year's Campania Tomato Sauce sales provided 16,115 meals to in-need youth across Western Canada and Ontario. Since Campania Tomato Sauce sales began in 2013, 22,368 jars of sauce have been purchased to support the 17 local communities in which Famoso operates. what's to love about this special sauce? Campania Tomato Sauce is made from only the finest vine-ripened plum tomatoes, picked from rich soils of Mount Vesuvius in Naples. Famoso's Campania Tomato Sauce is hand-milled and jarred to capture authentic Neapolitan flavours. Available only once a year during the holiday season, Campania Tomato Sauce retails for $8 per 500mL jar. For more information about Campania Tomato Sauce, visit www.famoso.ca/campania. Founded in 2013, Mealshare is a social enterprise that allows a person to turn dining out into helping out in his or her community. For each Mealshare branded menu item sold at a participating restaurant, Mealshare provides a meal to youth in need by funding shelters and school meal programs locally and around the world. It's simple - buy one give one. With the help of over 300 restaurant partners in seven major cities across Canada, Mealshare has served 1,644,186 meals to people in need. Don't miss out on this opportunity to help end youth hunger, one jar of tomato sauce at a time. Ok, now for the goods! I hope you LOVE love love this recipe and make it your own by customizing these buns with delicious nutrient dense fillings! & of course I'd LOVE for you to share the wellth by tagging your wellthy creations on social media! Preheat oven to 350. Lightly grease a cast iron pan with coconut oil. Alternatively you could use a glass baking dish. dissolve yeast and honey in lukewarm water and let stand for 10 minutes. Add warm water to a large mixing bowl. Add honey, oil, lemon juice and salt. Add yeast to mixture and stir. Add sufficient flour to make a soft workable dough. Turn dough out on lightly floured surface, kneed for 10-15 minutes, until you achieve a smooth and elastic consistency. Form dough into a ball and place in a greased bowl, turning once to grease the top. Cover and let rise for 50 minutes or until doubled. Punch down and shape into 4 round balls. Cover and let rest for another 20 minutes. Depending on the size of pizza pockets you want, you can use these values to help guide how to portion the dough: for burger size buns 90g and for dinner roll size buns 50g. Next, on a lightly floured surface, press dough to flatten it. Add desired fillings in the centre of the dough. Pull the sides of the dough up and over the filling and pinch the seams together. Place the rolls in the prepared skillet. Brush the top of the buns with coconut oil, shredded cheese and sprinkle with Italian seasoning. Bake in preheated oven for 20 minutes, or until the dough is golden bowl. serve while still warm and additional sauce for dipping, if desired.